Alentejo is a large region that takes up one third of Portugal’s land mass (that’s about the size of Belgium or Maryland). Nestled in between the Atlantic Sea and Spain, it’s called the garden or breadbasket of Portugal because its flat landscape makes it perfect for growing grapes, cork and wheat – and the black stork and wild boar seem happy in this habitat also. We love the ‘boho’ or creative feel that you find amongst the coastal villages and whitewashed, medieval towns. We’ve written this up as a circular driving tour – starting at Evora – which is the region’s best known and UNESCO-listed treasure trove. 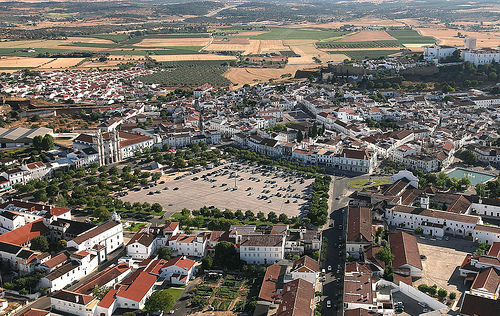 Drive 90 mins east of Lisbon city and you’ll find yourself in the centre of the Alentejo in Evora, this region’s most famous city. Must-sees in this walled UNESCO-listed city are the Roman Temple, Giraldo Square, the cathedral, the Capela do Calvário at the Church of San Francisco for its carvings, and the Chapel of Bones. If you have more time, consider adding on the Palace of King D. Manuel, the chapel of St Blaize, and the houses of Cordovil, the Casa de Garcia da Resende and the university. And leave lots of time for wandering around the charming cobbled streets. Be sure to try the pastries and, if megalithic structures are your thing, you’ll want to visit the 95 menhirs or standing stones that overlook the city. You’ll find many locations with a Jewish connection – do read out guide to Portugal’s Jewish sights for details on this community’s heritage here and throughout the Alentejo. Drive 50 mins SE of Evora towards the border with Spain. Don’t be fooled by this charming whitewashed village – given its proximity to Spain, it’s seen more than its fair share of battles, takeovers and defeats. The site on which the castle was built was a pre-historic fortification and the Romans, Visigoths, Mozarabs and the Knights Templar have all fought for or defended this space. That said, it’s hard to tally the stories of battle with the scenes you see today. If you are visiting in July, you’ll find the town becomes an open-air museum – celebrating the crafts, gastronomy and culture of this small town that fronts onto the Guadiana River and Alqueva Dam (one of the largest and most recent reservoirs created in Europe). 40 mins north of Monsaraz (driving parallel to the Spanish border) you’ll arrive at this town which is famous for its marble. In fact, you may have noticed large chunks of the stuff on your approach. We can arrange a visit to one of the quarries if you’d like to see how the rock is excavated and handled. And if you haven’t read about the House of Bragança, here is where you’ll learn about one of Portugal’s most important family of nobility who took on the town in 1461. The Ducal Palace is where the country was run from 1640 to 1910. Visit the marble museum, the castle, the Palace and the Carriage Museum is pretty interesting too. You’ll find a nice pousada here located in a former convent. Thanks to its privileged connections with the House of Bragança, it hosts an annual lunch for the Portuguese royal family that probably features the traditional “migas”, cod, and local lamb. If you’d like something more rustic, we can arrange a tasting and tour of the olive oil co-operative at Borba or a nearby winery. 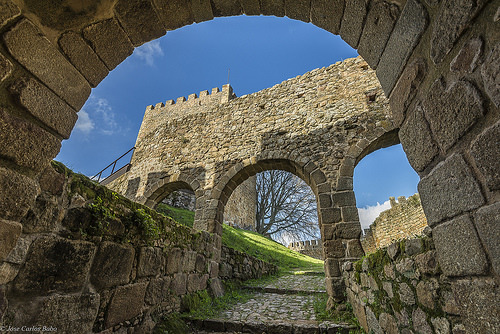 Just 22 mins from Vila Vicosa, you’ll want to explore the old city inside the walls. Along with the castle, town walls, charming cobblestones and churches, you should seek out the local barrística (clay pottery) and check out the brilliant weekly farmers’ market on Saturdays in the town’s main square. Wherever you look, you’ll notice a lot of marble here as this is still marble territory. The castle has become a pousada which is always a handy place to stay or enjoy a drink or a meal – the views are spectacular and it is fit for a queen – which is no coincidence as it was built on the order of King Dinis I of Portugal for his wife, Queen Isabel. 30 mins from Estremoz and right on the border with Spain (just 30 mins from the Spanish frontier city of Badajoz), you have come here to see the very impressive Amoreira aqueduct. Work commenced in 1529 and it was finally inaugurated 99 years later in 1628. Featuring 833 arches, we recommend you start out at the town fountain and walk back along to get a sense of the size and importance of this aqueduct. When you’ve have your fill of civil engineering, leave some time to visit the city walls, castle and battlements of Elvas which are listed as World Heritage by UNESCO. 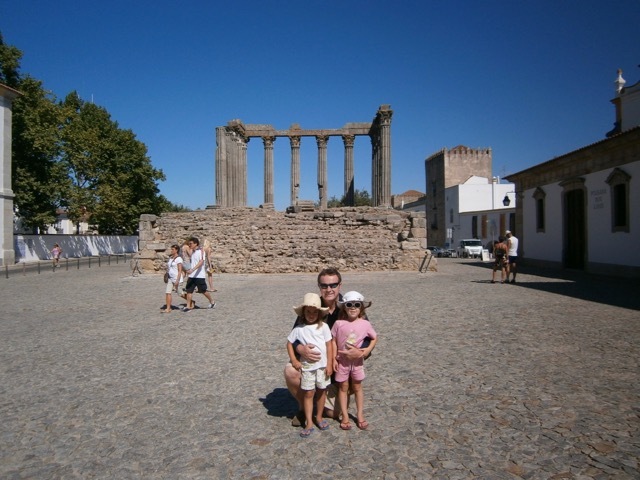 One hour NW of Elvas brings you into the Serra de Sao Mamede Park and into Marvão. 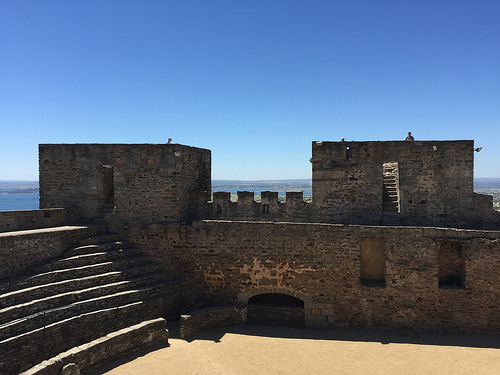 You’ll head straight for the castle on the tallest and narrowest of ridges to learn about the many tussles that have taken place in this area and enjoy the wonderful views of the Alentejo and Spain. Built 843 metres above sea level, you’ll really enjoy a birds-eye view of the locality especially from the well-preserved city walls and the keep. Drop into the Municipal Museum (located in a former church) inside the walled town to learn about life as a frontier post –you’ll find many references here to the Jewish community that passed through this town from Spain during the Inquisition. See our guide to Jewish heritage in Portugal here for more. If you like hiking, check out the eight excursions in the Sao Mamede park where you’ll be able to find the eagles, vultures, hawks, owls plus wild boars, Egyptian mongooses, wild cats and more. You’ll find another lovely pousada here which makes a pleasant break when you’ve seen the sights. The views from the dining room are pretty amazing! 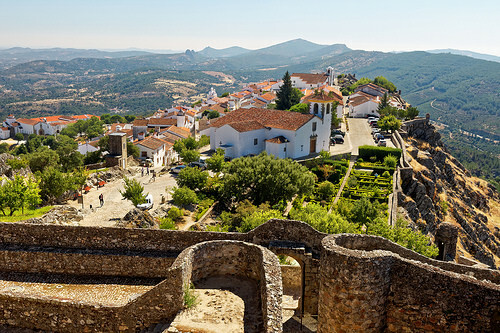 Just 20 mins from Marvão, you are now at the very top of the Alentejo Region to see another town of Roman origin that was home to a large Jewish community in the 14th century. Many of the houses in the Jewish quarter still have door indents or markings! And you can visit the restored medieval synagogue at the corner of the Rua da Judiaria and Rua da Fonte that includes a stone ark for the Torah and see the Arcario House where Jewish taxes were collected. For more see our guide to Jewish sights in Portugal here. With a name like Castelo de Vide, you know there must be a castle in the town and there is a great one that was completed in 1327 which is also when the town was renamed from Vide to Castelo de Vide. You’ll also find churches here – 24 of them. We enjoyed the 13th century Capela do Salvador do Mundo which is said to be the oldest chapel in the region. If you want to go even further back, you can also trace the town’s Roman history by visiting the Roman settlement of Miróbriga nearby. If you have time for one more castle, our circular driving tour finishes at Belver Castle, 45 mins from Castelo de Vide. From the top of the castle you have an exceptional panoramic view over the River Tagus. Belver itself is quite small but if you’ve never been to a soap museum, you should check out the Museu do Sabão. The town had a monopoly on soap-making until the 18th century when the villagers took things into their own hands. Not only do you learn about the history of its production, but you can also make your own soap at the museum. If you’ve run out of time, it’s less than 2 hours from Belver back to Lisbon city and you can reference our guide on the Lisbon region for places to stop off en route – such as Tomar – one of the Templar cities which is less than an hour away. 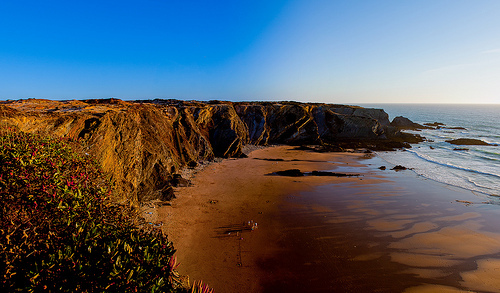 But there’s also lots more to see in the Alentejo – including the stunning coastline! And we’re not the only ones who love the Alentejo coastline. The Guardian is also a fan and suggests that we “forget the Riviera. 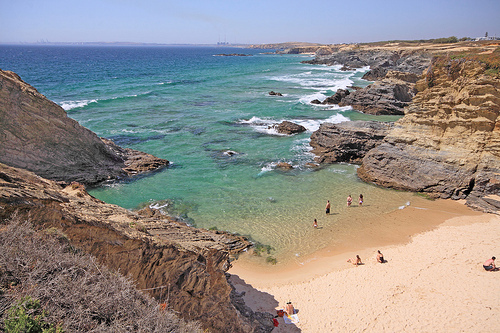 In fact, forget the Med altogether.” The Alentejo region is lined with glorious beaches that are gloriously crowd free except perhaps in the height of July and August. Perhaps that’s why shoe designer Christian Louboutin has not one but two homes on the Alentejo coastline. His first purchase was in Comporta and his second was in the Melindes area. Why? The Guardian describes the coastline here as “most stunning beaches in Europe”. And that’s not the only draw – we love it because it’s considerably less built up than the Algarve. There are no big hotel chains or large developments. Instead you have excellent country hotels that might be a couple of kms from the beach, but they always have lovely gardens, pools and even spas. Here are some of our favourite beaches! 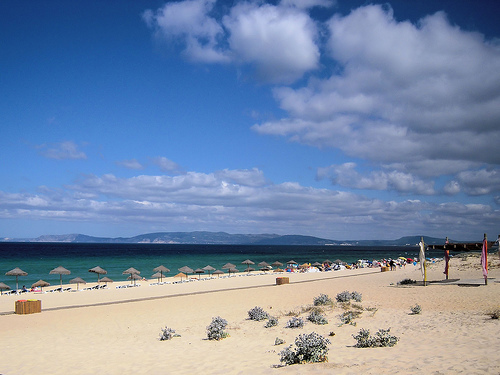 The New York Times loves Comporta which is just one hour from Lisbon. Calling it the “anti-Algarve”, it praises the “hippie-chic Comporta, a protected nature reserve and former fisherman’s village in the Alentejo region, which is deliberately underdeveloped and teeming with creative European A-listers. Go before the branding happens,” it says. From Comporta, you can drive up to the tip of the Troia Peninsula – although not technically in the Alentejo, it’s worth the detour to visit the archaeological sites as well as great beaches. (NB You can travel from Troia to Setubal on the other side of the estuary by car ferry or catamaran which might be an interesting access route into the region). From Troia, you can join a boat trip on a Salt Galleon (Galeão do Sal), a traditional sailing boat on the River Sado, in search of dolphins and flamingos. You’ll find a similar service is offered on catamarans in the Sado Estuary. 30 mins south of Comporta in Melides you’ll find the wonderful sandy beach of Praia da Aberta Nova, which is surrounded by beautiful sandy dunes. With the exception of the little café and carpark that are away from the strand, this beach is 100% undeveloped. In this area known as Sines, just 40 mins south from Aberta Nova, you’ll find the Praia de Morgavel which is another gorgeous beach. Again, there’s a small restaurant nearby but otherwise, this is a quiet beach and great for families. This beach is actually inside a Natural Park (Parque Natural do Sudoeste Alentejano e Costa Vicentina) which protects the area from the developments you come across on the southern Algarve. All the beaches that follow below are also inside the same park. If you want to try windsurfing or kitesurfing, travel the 3 minutes north to Sao Torpes – the preferred beach for windsurfers and kitesurfers. Seven minutes south of Morgavel, we love the Praia Grande de Porto Covo which is again in the natural park. As the name suggests, this is a beautiful cove which is protected by the rocky cliffs around it. You need to walk down from the carpark towards the restaurant and on again to the beach. Smaller kids will have fun in the water and checking out what sea-life can be found in the rock pools while the older children can explore the caves. The old fishing village is right beside the beach – you’ll enjoy a wander amongst the whitewashed houses when you’ve tired of the water and the waves. A 12-min drive from Porto Covo takes you the Praia da Ilha do Pessegueiro. This beach is on the mainland but looks out to the Island of Pessegueiro on which you’ll find a 15th century fort. The island is just 300m from the mainland but, as you can imagine, is a haven for sea-life and birdlife. Further south, we enjoy stopping off at Vila Nova de Milfontes before crossing the Mira River and hitting the beach at Praia da Zambujeira do Mar. It’s just 45 mins from Pessegueiro and still inside the natural park. The village backs onto the beach so you’ll find plenty of accommodation and dining options right by the sea here. If you are curious about the Algarve, it’s only a 30-min drive from Zambujeira to the Praia de Odeceixe and you can continue on to the many other great beaches in the Aljezur province to get a sense of how busy this region gets. If you enjoy hiking and love beaches, you’ll definitely want to walk a few stages of this 400km coastal walking trail that stretches from the Alentejo into the Algarve. The Guardian rates it very highly: “the trail,” it says, “at times steep and rocky, is magnificent. Paths down ravines revealed deserted sandy coves; each headland climbed brought a further vista of cliffs and stacks, home to raggedy storks’ nests.” If you are interested, there are three separate routes to choose from – the Fishermen’s Trail, the Historical Way and five Circular Routes. Herdade do Touril is a nice place to stay in the Zambujeira do Mar area, if you are passing through on the trail. 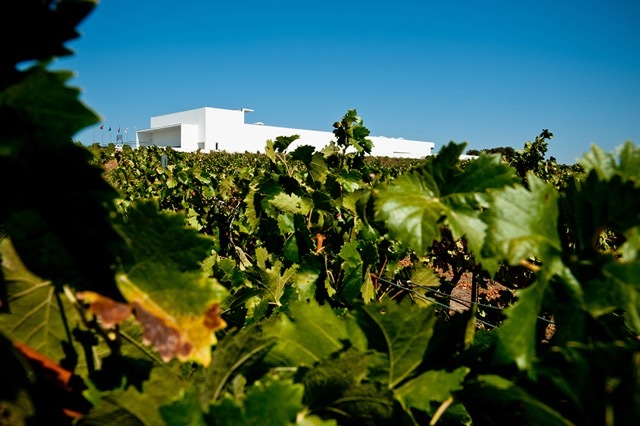 We highly recommend visiting one or two Alentejo wineries called ‘adegas’ as well as sampling the local wines when eating out. Try both the red and white wines which you’ll find labelled as Vinho Regional Alentejano, Vinho DOC– Alentejo, and Vinho Regional – Terras do Sado – which is the territory near Setubal. You’ll find vines throughout the region and your hotel can recommend which are the best estates known as ‘heredades’ to visit locally. Of course, you may want to stay at a winery and this region offers some great accommodation amongst the vineyards. If you love architecture and wine like we do, this is a must-see in Campo Maior (Upper Alentejo). Designed by one of Portugal’s leading architects, Alvaro Siza, this winery won the best national wine tourism prize 2015, by the Wine Magazine. According to the jury, Adega Mayor offers that perfect combination of being able to handle large volumes of visitors while still providing “an intimate atmosphere that makes each of us feel at home.” Although you can’t stay at the winery (what was Alvaro Siza thinking of ?!) you can stay at the nearby Hotel Santa Beatriz. If you travel in September, you’ll get to see the flower festival dedicated to St John the Baptist, patron saint of Campo Maior. It’s a real riot of colour that your camera will struggle with – never mind your own eyes. Filters are definitely not necessary. Part of the Bacalhoa group, with wineries throughout Portugal, the winery in Estremoz (as you can see here) dates back to the late 15th century, when King John IV is said to have had the estate constructed in the Alentejo region. More recently the name was connected with Lafite Rothschild, until Bacalhôa Wines of Portugal acquired the entire Quinta in 2008. You may also be interested to see the Dona Maria winery in Estremoz run by Julio Bastos who used to own the Quinta do Carmo before selling it to the Rothchilds. The Herdade da Malhadinha is a family run winery, hotel & spa in Albernoa, Beja (pictured above). In the same area you’ll find Herdade dos Grous farm, hotel, restaurant and wine-bar. We also like the Herdade de Sobroso, hotel, winery in Vidigueira. 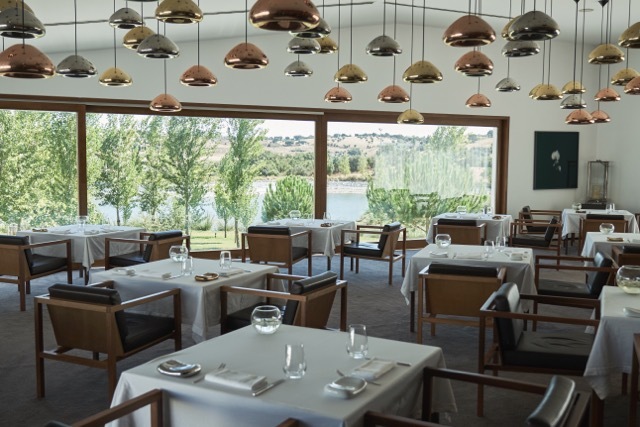 And the Herdade de Vau, hotel, winery in Guadiana – where activities include the usual array of tastings, hiking, and horse-riding plus (if you are into this sort of thing) a hunting trip. If you are visiting any winery in the Alentejo in November, you should know that of the tradition to taste the new wine on St Martin’s Day which is 11th November. And we recommend you keep an eye and ear out for information about wine or harvest festivals throughout Autumn. The Telegraph says the Alentejo has Portugal’s richest culinary heritage and we are inclined to agree. It’s hard to know what we love most. The olives and olive oil? Amazing! The cheeses? Out of this world! The cured ham called presunto? Delicious! And it’s impossible to describe just how good the roast lamb is! And – as with anywhere in Portugal – the choice of seafood on offer is dazzling – sardines, seabass, bream, salmon, lobster, prawns, crabs, goose barnacles and clams. Our tip? 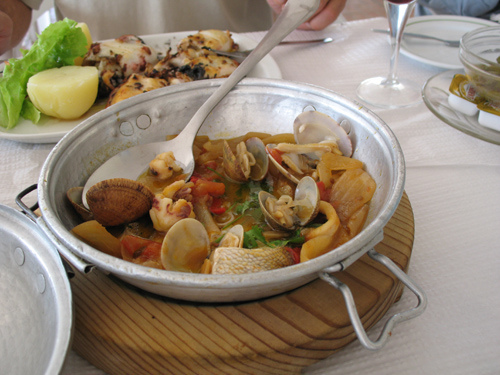 Try the cataplana which out can see pictured below. Where can you enjoy the best local cuisine? We’ve listed some of the pousadas which are great for showcasing regional recipes and local ingredients. And we’ve had some great seafood on the coast – often at the small bars or restaurants on the beach. We’ve also eaten some pretty memorable meals at the region’s wineries and L’and is pretty hard to beat when it comes to the best of local ingredients created by a top chef. The ‘a la carte’ menu is very reasonably priced and the tasting menu offers incredibly good value too. Everybody has heard of the Portuguese fado – but the Cante Alentejano – the style of singing here in the Alentejo – is well below the radar for most of us. It is performed by amateur choral groups without instrumentation and can be heard at both public and private social gatherings throughout the region. Have a look at this video of the traditional Alentejo song which you might come across at a festival or other celebration. It was listed on UNESCO’s cultural heritage lists in 2014. And if your ears need another (but very different) treat, why not visit the Museu do Chocalho (livestock-bell museum) in Alcáçovas, with more than 3,000 bells, each with its own unique identifiable sound? You will need to book an appointment with the tourist office. If you’re travelling with a family, you’ll need to balance the museum visits, long lunches and winery tastings with activities that excite the younger travellers and we’ve found that our younger clients love a horse-riding lesson or trek for the more experienced. We visited Naturate in Vila Nova de Milfontes who organised us a fantastic afternoon of horse riding in the countryside. 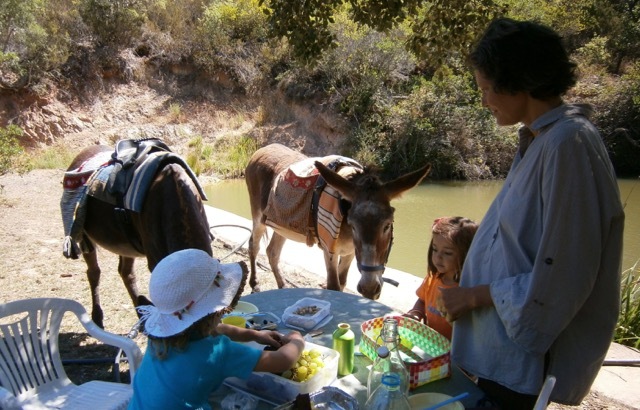 And on a separate trip we also did a trek with donkeys through Casa Brancas, which is another brilliant activity with children. The Alentejo is known inside Portugal for its pottery and painting, leatherwear and its tapestries, which we adore. You can get to know the history of tapestry making and see the permanent exhibition in the Museu Guy Fino, in the Palácio Castel-Branco, in Portalegre – where you’ll learn about the Portalegre stitch and see some tapestries by the region’s most famous names. If you can’t make it to Portalegre, in Evora you can visit the Traditional Arts & Crafts Museum where you will also see some examples of the region’s fine crafts. You can’t come to the Alentejo without experiencing the cork. You’ll start by seeing the ‘montado’ which is the cork woodland and pasture. And then you’ll find cork used for everything from shoes, to clothes, and even post cards. And if you are really lucky, you might see the cutting of the cork and the surprising orange colour of the bare trunks. 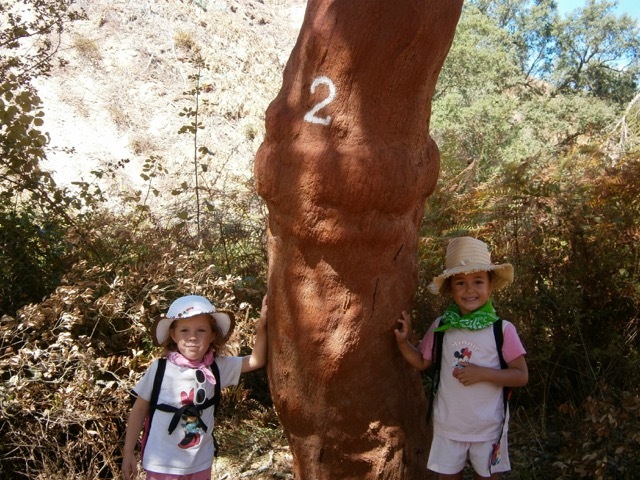 The bark of the cork oak can only be removed every nine years, so ask for suggestions at the tourist office or your hotel (or us!) to see this unique event. It usually takes place during the months of June and July. 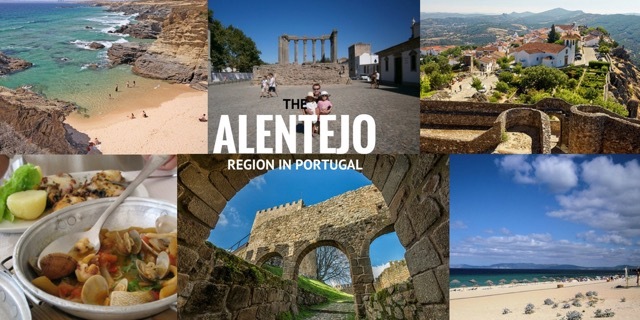 Posted in Active breaks, Alentejo Region of Portugal, Beaches, Castles, Popular Posts, Portugal, Wineries and tagged Aberta Nova, arts & crafts, Belver, Cante Alentejano, Castelo de Vide, cataplana, Comporta, cork, Donkey-trekking, Elvas, Estremoz, Evora, Horse-riding, Ilha do Pessegueiro, Lisbon, Marvão, Monsaraz, Morgavel, Porto Covo, Praia, presunto, Sao Torpes, seafood, UNESCO, Vila Nova de Milfontes, Vila Vicosa, Vinho DOC– Alentejo, Vinho Regional – Terras do Sado, Vinho Regional Alentejano, Zambujeira.